I've been meaning to mention the pink/yellow poll results for awhile. I was quite surprised because the number of views of the yellow and pink cupcake cards in my etsy shop suggest the reverse preference to the poll results. The pink has consistently had double the views and yet the vote was unanimous for yellow. 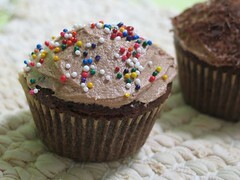 It's a cupcake mystery! In any case, this means it's time for a new poll soon. I'll post one as soon as I come up with a good (or sufficiently silly) question. On Saturday, I experimented with paper-making along with several of my crafty girlfriends: fuzzymitten, lainevierge, superfink, and callmepavlov. We get together for crafty parties every month or two and have knitted, sewed, baked, and carved rubber stamps in the past. It's fun to try out new things, teach each other new skills, and inspire one another to be more creative. We used the technique described in this tutorial. It was messy, but lots of fun. We collected all sorts of scraps for our paper: leaves, petals, fabric, tissue paper, wrapping paper, old comics. Just make sure that you don't use glossy paper because it won't break down as well. Coloured tissue paper has a lot of dye, so it's a good choice if you want to add colour since colour dilutes a lot when making paper with this method. 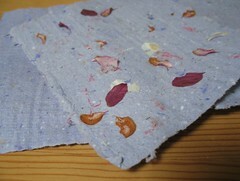 The paper shown above had dark purple tissue paper scraps added to a greyish paper slurry. It looked quite dark when wet, but dried to a pale blue-purple. I was also tagged by fuzzymitten for this meme. I was just starting my B.Math in Computer Science. 2. What are five (non-work) things on my to-do list for today? It's hard to really imagine, but I expect I would travel more and I'd like to think that I'd give a lot of that money away. So I have some means of comparison when I say that I love Montreal. Consider yourself tagged if you'd like to be! We've lived in our flat for 3 years now and had 3 different downstairs neighbours. None of them have ever tended the little patch of earth next to our steps that's just outside their gate. I cleared it out once and the previous tenant said she was planning to plant impatiens, so I left it be, but she never did and it grew all weedy again. Last year, the new tenants tended the rest of the overgrown yard and I thought they might do something with it, so I left it. This year, despite attention to the rest of the yard, it remained neglected, so I decided that it was time to strike with a little guerilla gardening. I should have taken a "before" picture because it was a horribly tangled rectangle of grasses and weeds that looked appalling. Now, it's neatly planted with some perennial ground cover (creeping thyme, veronica, and saponaria) and a few petunias. Perennials mean that it should be nice again next year, with no further attention and ground cover should hopefully deal with most of the weed problem. The neighbours seem to approve as they've watered it and helpfully added some woodchips around the plants. 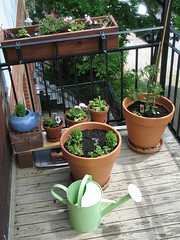 I also planted up my own balcony garden ... mostly pots of flowers, one tomato plant, and some herbs. I've tried other edibles over the years (saladry, carrots, beets, spinach, swiss chard), but I've been most successful with tomatoes and herbs. I'm trying to make the front balcony a riot of flowers this year to maximize the enjoyment of sitting out at my bistro table. I have a number of morning glory seedlings that I hope will trail all over the railings, though they sure looked unhappy going in (if I have to plant new ones, I won't have gained anything from starting them inside in April). You can see more pictures in my Gardening set and I'll be adding more as it fills out over the summer. I made this card on Earth Day and used that as my inspiration. The card involved repurposing some scraps of old fabric for the dresses and tree and the theme of the card was reverence for nature. How I imagine these two string girls is that they are a Mom and daughter in the park pointing at things they see like flowers and birds. 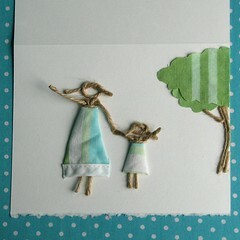 I recently sent a couple of my string girl cards in the mail (for Mother's Day). I wanted to test them before including them in a craft fair or at my etsy shop. They turn out to have no problem going as regular lettermail, though I did include a protective piece of bristol board so that no mail sorting machines could catch on the twine. While I know that people often give cards in person or along with a present, I want my cards to also be suitable for the mail. I think it's important to keep those ties to loved ones who are far away. Email is very convenient, but I don't get the same satisfaction either sending or receiving it as I do with a tangible note that I can hold in my hands. While there are environmental reasons to try to cut down on paper usage, there are times where a virtual version can't and shouldn't compare to the real thing. I don't know anyone who displays emails on their mantlepiece, for example. A handmade card makes the thought more special. There are also some situations where a real card is the only appropriate way to express your sentiments (e.g. weddings or condolences). There's something about being able to hold a message in your hands and know that the sender also held it. That sense of continuity and tangibility makes the connection and sentiments more real. Recently, there was a challenge to draw your teenage self and then draw yourself as you are now. 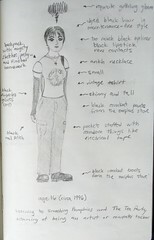 I did sketches of myself at 14, 16, and 28. It's a mix of embarrassing, amusing, nostalgic, and fun. Self-portraits are always tricky. There's the difficulty of getting it to look like what you recognize as "you". And then there's also how much to put in of the things that you admire or despise about yourself. Pretty much no one but you notices most of those little details, but they're part of your self-identity and translating that onto paper is a challenge. I hope that some of you try this out, even if you keep the results to yourself. I'm not sure what it is, but lately, my creative energies have been brewing in the kitchen. Every fall at the market, I'm drawn to the bright red little beads that are fresh cranberries. The shiny rich crimson promises a delicious, tart flavour and I have visions of traditional garlands. However, I always buy more than I really need and end up with many extra portions in the freezer. I usually use them for making Cranberry Cottage Pudding, but I felt like trying something a bit different on Thursday. A friend came over for tea and conversation about changing one's direction in life. I've been focusing on things that don't directly relate to my background in math and computer science and she is contemplating a move away from science as well. It's not an easy thing to choose and I'm still figuring things out as I go, but so far, it's certainly made me happy. While she did some knitting, I did some pastry-making. Kitchen-witchery at its best: tea, friendship, and creation. 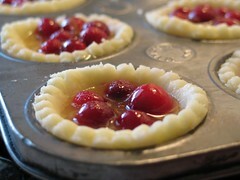 I had in mind a cranberry tart, so after a bit of searching, I found this recipe for a cranberry orange tart. I made my own crust and made little tarts instead (and skipped the walnuts because I didn't have any), but the filling is yummy and super simple. I was lucky enough to have some of my Grandma's delicious orange marmalade, which adds a depth of background orange flavour. I didn't really measure that part or the orange zest. I just used a wobbly, heaping spoonful of marmalade and all the zest of one orange. People often complain of baking that you must be precise and can't improvise. My experience is that as long as you take care in altering the ratio of wet to dry, the flour, fat, salt, sugar, and leavener, you can do what you please. Which basically means that I never worry about changing flavours or adding a pinch of this or that. And I frequently just use ordinary spoons rather than "measuring" spoons since there's a reason that they're called a table and tea spoon. The tarts come out of the oven quite molten, and I recommend cooking them over another pan since mine certainly bubbled over. Once they'd cooled a bit, I sent my friend home with some tarts (since the real purpose of baking, in my belief, is the sharing of the eating). Even if we neither of us had any more answers about how to lead an artistic life, at least we didn't feel quite so alone in stumbling to find a path.